Celebrate New Year’s Eve by sharing personalized messages through these easy to make paper fortune cookies. You can use the printable messages I created, or make up your own. 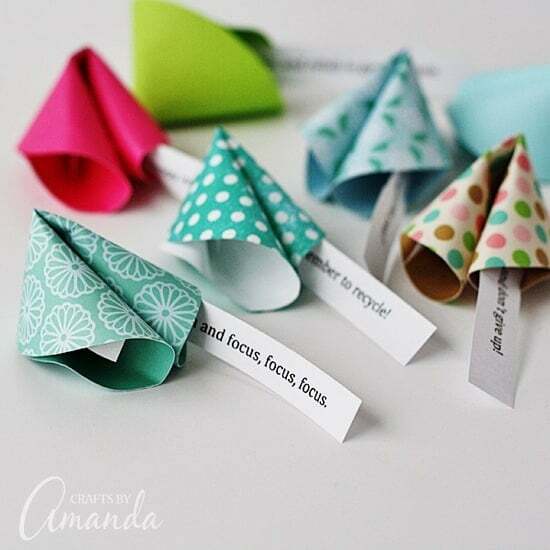 These fortune cookie messages are fun to give to friends, family and neighbors, and kids will love them for their friends and teachers too! This is a fun New Year’s Eve craft for adults and also makes a great kid’s craft. I recommend using scrapbook paper. Construction paper is a lower quality paper and may not give and bend the way you need it to. However, if you would like to give construction paper a try, by all means do! 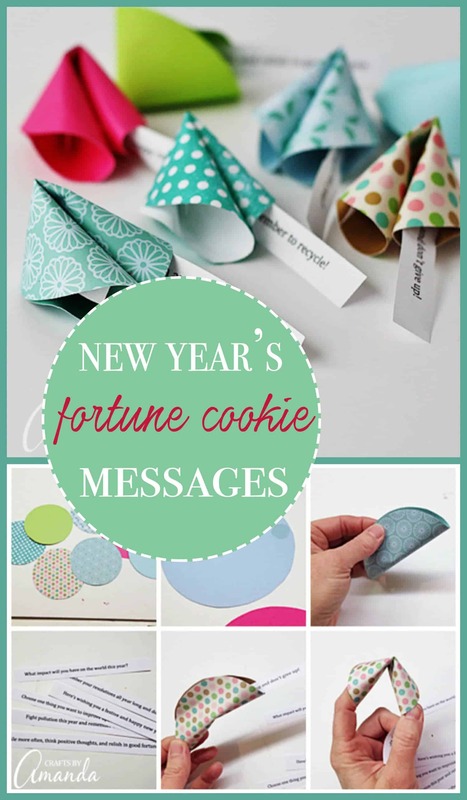 Would love to hear how your fortune cookie messages turn out! 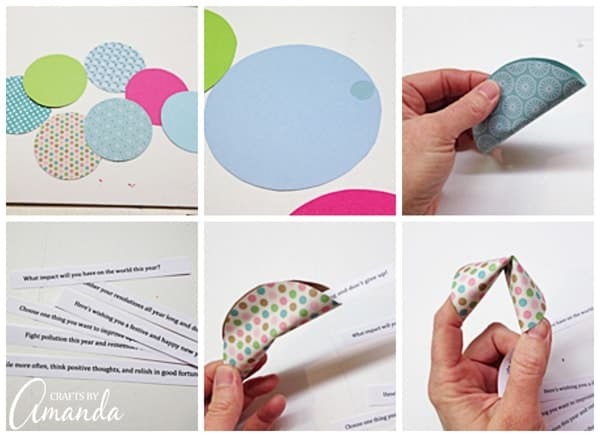 Cut scrapbook paper into circles that measure 3 1/2″ in diameter. Turn the circles over and place a glue dot at the top edge or each one. Fold the circle in half, securing with the glue dot. Do not crease the fold. Print off the messages I’ve provided on the template, or open up a Word document and create your own sayings! If you prefer, you can hand write your messages. Try using a gold marker for a festive look! Cut messages into thin strips. Insert message into the half circle. Using your forefinger in one end of the half-circle, and your thumb in the other, bend the half circle into a fortune cookie. Secure the ends together with another glue dot. For more New Year’s Eve fun for kids, try this Paper Plate Party Animal. For adults, these Confetti Champagne Glasses are always a hit! If you’re looking for more New Year’s activities and crafts for kids, check out these 30 ideas at Red Ted Art. Cut scrapbook paper into circles that measure 3 1/2" in diameter. Print off the messages I've provided on the template, or open up a Word document and create your own sayings! If you prefer, you can hand write your messages. Try using a gold marker for a festive look! Cut messages into thin strips. I originally made this project for Spoonful, which has since closed and the instructions were taken down. I am putting the instructions here until such time that Spoonful projects are redirected to a new home. At that time I will remove the instructions and link directly to the project on their site. Originally published here December 28, 2013. Cute idea and it would also make for a fun item to pass out as a Random Act of Kindness! This is an awesome New Year’s project for kids. Thank you for this wonderful idea! I hope to incorporate this one very soon!! !